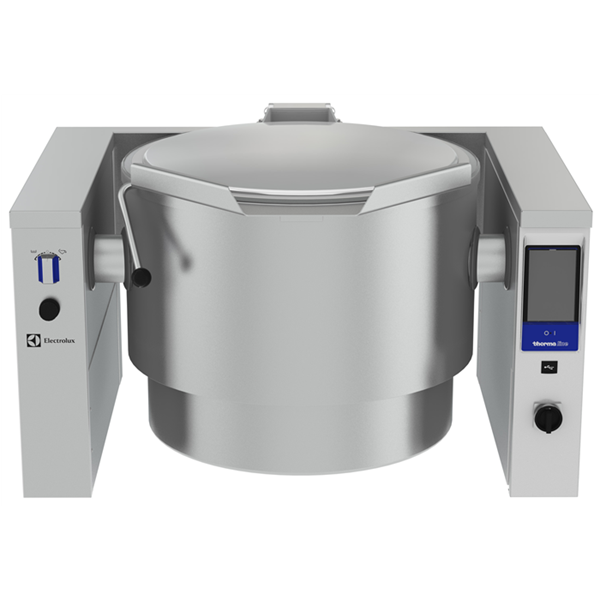 Kettle is suitable to boil, steam, poach, braise or simmer all kinds of produce.Hygienic profile, freestanding. Kettle is jacketed up to 134 mm from upper rim. Isolated upper well rim avoids risk of harm for the user. Max pressure of inner jacket at 1,5 bar; minimum working pressure at 0.1 bar. 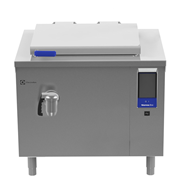 Allows temperature control between 50 and 110°C. 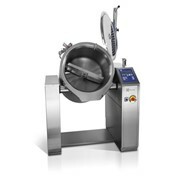 Ergonomic vessel dimensions, with a large diameter and shallow depth facilitates stirring and gentle food handling. Edge of the large pouring lip can be equipped with a strainer (option). Motorized, variable pan tilting with "SOFT STOP". Tilting and pouring speeds can be precisely adjusted. 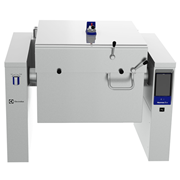 Pan can be tilted over 90° to facilitate pouring and cleaning operations. 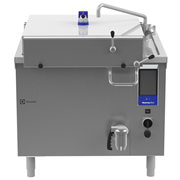 Built in temperature sensor to precisely control the cooking process. USB connection to easily update the software, upload recipes and download HACCP data. 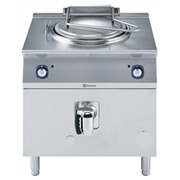 Cooking vessel in 1.4435 (AISI 316L) stainless steel featuring directional pouring lip. 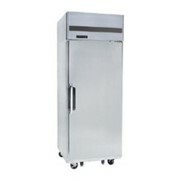 Double-jacket in 1.4404 (AISI 316L) stainless steel designed to operate at a pressure of 1.5 bar. 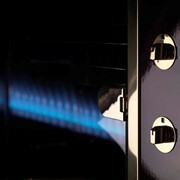 External panelling and internal frame made of 1.4301 (AISI 304) stainless steel. 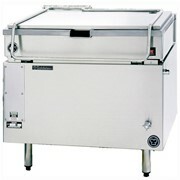 Double-lined insulated lid in 1.4301 (AISI 304) stainless steel mounted on the cross beam of the unit, counterbalanced by a hinge that remains open in all positions. Safety valve avoids overpressure of the steam in the double jacket. Safety thermostat protects against low water level in the double jacket. Ergonomic and user friendly thanks to the high tilting position and the pouring lip design which allow to easily fill containers. 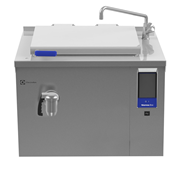 Water mixing tap is available as optional accessory to make water filling and pan cleaning easier. Front-mounted inclined led “TOUCH” control panel with recessed deep drawn casing, features self-explanatory display functions which guide operator throughout the cooking process: simultaneous display of actual and set temperature as well as set cooking time and remaining cooking time; real time clock; “SOFT” control for gentle heating up for delicate food; 9 power simmering levels from gentle to heavy boiling; timer for deferred start; error display for quick trouble-shooting. 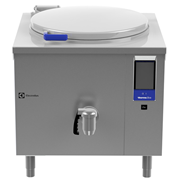 Possibility to store recipes in single or multiphase cooking process, with different temperature settings. 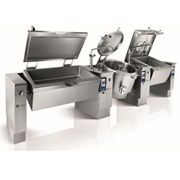 Minimised presence of narrow gaps for easier cleaning of the sides to meet the highest hygiene standards. Can be prearranged for energy optimisation or external surveillance systems (optional). 98% recyclable by weight; packaging material free of toxic substances.